We all know that we have an energy issue. And a pollution issue. And a whole bunch of issues with the way that we produce and consume materials. However, a new study from Rutgers University predicts that large-scale power plants based on thermoelectric effects (like small temperature differences in ocean water) could generate electricity at a lower cost than standard power plants. With this new kind of power plant, electricity is generated by heating cold, deep water with warm, shallow water heated by the sun. Liping Liu, Associate Professor at Rutgers University Liu has published a paper in the New Journal of Physics in which he analyzes the feasibility of such power plants. If this really could work, it would be rather amazing, as the ocean is the largest accessible, sustainable energy source on Earth. This is because the sun heats the surface water of the ocean to a temperature that, in tropical regions, is about 20 K (36ºF) higher than water that is 600 m (1,900 feet) deep. In this respect, the surface water acts as a giant storage tank of solar energy. 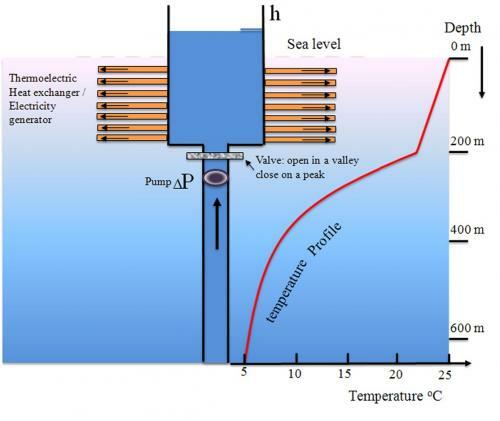 thermoelectric power plants would work by harvesting the energy of ocean waves to pump cold water from a few hundred meters deep up through a long channel. As the cold water nears the surface, it enters a heat exchanger where it is heated by surface water on the outside. The heat exchanger acts as an electric generator, as its tubes are made of thermoelectric materials that can transfer heat through their walls and directly convert temperature differences into electricity. In large-scale, ocean-based thermoelectric power plants the “fuel” (the temperature differences) are free, unlimited, and easily accessible; the plants will not take up any space on land; since they have no moving solid parts, they would have low maintenance costs; the power output does not depend on the time of day or season. And finally, the method is green, as it does not release emissions. Also, up to 88,000 TWh of power could be generated a year from oceanic thermal energy conversion without impacting the ocean’s thermal structure. Another by product could be fresh water from the sea (important as populations and droughts continue to increase). Most commercial devices have a conversion efficiency of around 5% to 10% of the ideal Carnot efficiency, with state-of-the-art devices achievingefficiencies of up to 20%. The estimated cost per year of one megawatt of electricity in 2016 is about $0.83 million for conventional coal plants, compared to $1.84 million for photovoltaic power plants. Liu’s analysis estimates that a thermoelectric power plant could generate electricity for less than $1.84 million. So it’s more expensive than coal, but cheaper than other forms of production. Moreover, If water from geothermal sources is used instead, the temperature difference could be 50 K or more, resulting in an even higher power gain and lower cost per watt.